It’s finally October! Autumn is my favourite time of year, both sartorially and culinary. The month of cosy jumpers without the need for a coat, cute ankle boots with thick black tights and wide brimmed hats. I love it. Plus it means that you can start putting pumpkin in everything. 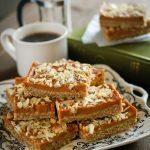 I recommend you start your yearly pumpkin journey with these pumpkin pie bars. From drinks to cakes to a hearty risotto, there’s barely a meal goes by in my home that doesn’t feature those sweet orange gourds. I can’t be the only one, right?! 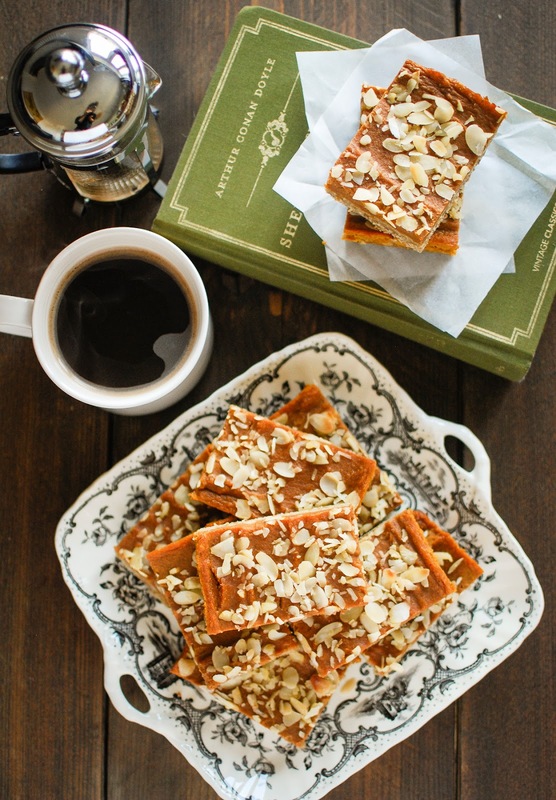 Pumpkin pie bars are the perfect way to ease you into the season. Soft and delightfully spiced with a nip of dark rum, these cosy bars will have you dreaming of orange leaves and crisp afternoon air. To make the base place the sugar, oats and flour in a large bowl and stir together. Add the butter in and rub together with your fingertips till the mixture resembles breadcrumbs. Press this mixture into your tray and bake for around 18 minutes, until golden brown. Set aside to cool while you make the topping. To make the topping put all of the ingredients, except the almonds, into a large bowl and beat until combined and smooth. Pour the pumpkin mixture on top of the cooked and cooled base, spreading it out into an even layer and sprinkle with a handful of flaked almonds. Bake for 20 – 25 minutes, until firm to the touch. Leave to cool completely before cutting into bars and serving. I’m submitting this recipe to Lavender & Lovage and The Hedgecombers October Tea Time Treats. These look delicious, and much more easier to carry around than a conventional pumpkin pie! These look lush! Always wants to try a sweet recipe with pumpkin but as this one does they call for canned purée and I've had no luck finding that in any shops. Any advice? 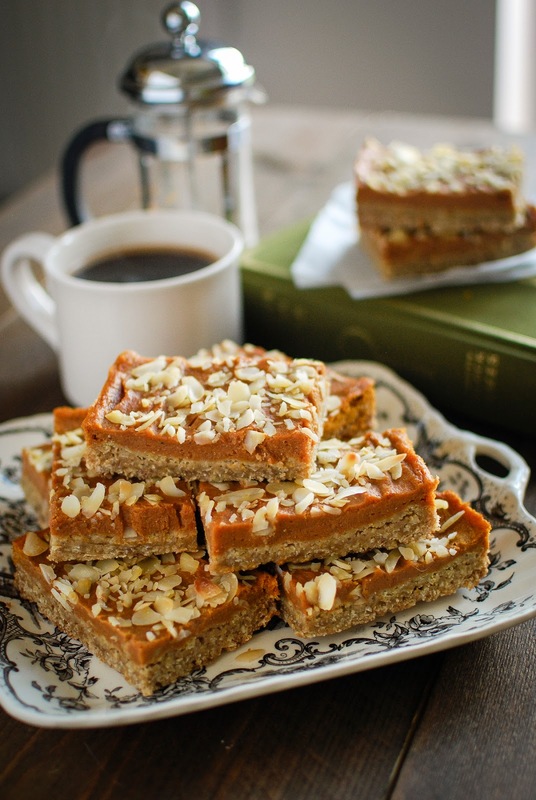 FABULOUS recipe for this time of year and thanks for adding it to Tea Time Treats too! Perfect for tea time! first time at your blog..will look around!